Moorefield U9 Hurling team played Clane yesterday at home in the Autumn league. Well done to the lads for shining through in a tight tough game. There was the usual teamwork from the entire team when attacking or defending, and once again this year they battled to the final whistle. Well done to the Under-9 hurling team who took part in the County blitz this morning in Hawkfield. There were three games v Confey, Milltown and Cappagh in the autumn sunshine. Each player put in a huge effort once again for the club with the team putting up big scores in all three games. Thanks again to the parents for being there for the early start and for their great support. A busy weekend of hurling for the lads playing St Laurences in a very competitive challenge game on Saturday afternoon. Both teams played their hearts out with some excellent scoring throughout. The players and parents received the usual warm welcome from St Laurences GAA Club, who put on a great spread in the clubhouse after the game for everybody, and a big thank you to them for a great afternoon. Also a special Mention to Martina for the excellent pictures taken. There was also a tough home game v Ardclough in the Autumn league on Sunday morning, where once again the lads played an excellent match with every player put in an excellent effort. Both teams showed their skills at defending and attacking, with some great tackling and scoring. A big thank you again to the parents for supporting the team two days in a row. The Under 9 Hurling team played their second match of the Autumn League against Sarsfields away on Sunday morning. Once again this group of players showed their strength as a team, with every player battling from start to finish. Some great defending and excellent scores by the lads again who are really putting pride in the Moorefield jersey each time they put it on. Thanks to all the parents for their support and effort. 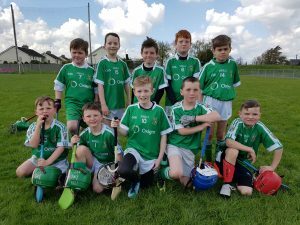 Moorefield U9 hurling team visited St Laurence’s on Sunday for a very competitive game, with skills and sunshine in abundance. Not deterred by the heat the players once again showed their commitment to the team with an excellent performance by all. Well done to a very strong u 9 Moorefield hurling team who did their club and families proud with a great performance against a tough Milltown side. We had a water tight defence thanks to the teamwork shown by all the lads, who couldn’t miss the target each time they took a shot. Also a big thank you to Milltown for a competitive game and the usual warm and friendly welcome we get when we visit. A great battling performance by all the players, from Goalkeeping to attack. All players were involved from start to finish, showing off the skills of the game.